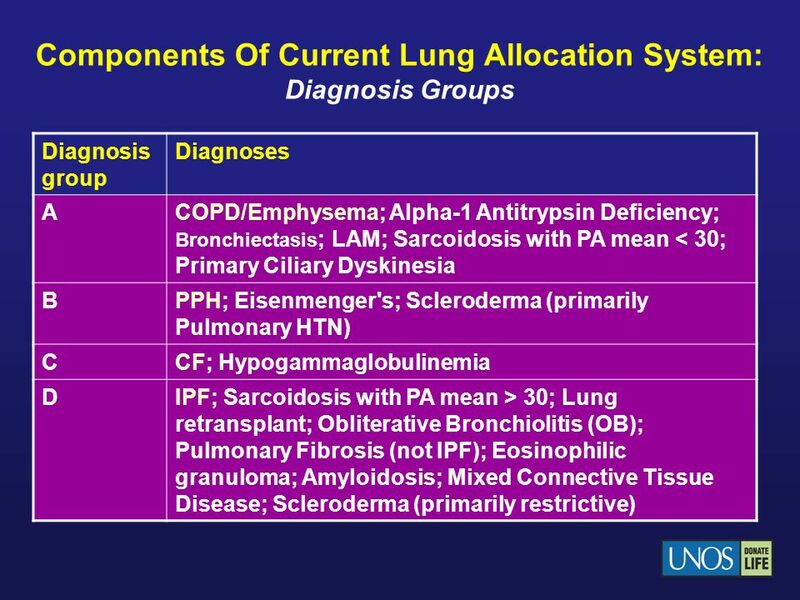 Diagnoses A COPD/Emphysema; Alpha-1 Antitrypsin Deficiency; Bronchiectasis; LAM; Sarcoidosis with PA mean < 30; Primary Ciliary Dyskinesia B PPH; Eisenmenger's; Scleroderma (primarily Pulmonary HTN) C CF; Hypogammaglobulinemia D IPF; Sarcoidosis with PA mean > 30; Lung retransplant; Obliterative Bronchiolitis (OB); Pulmonary Fibrosis (not IPF); Eosinophilic granuloma; Amyloidosis; Mixed Connective Tissue Disease; Scleroderma (primarily restrictive) These cover about 95% of registrations. 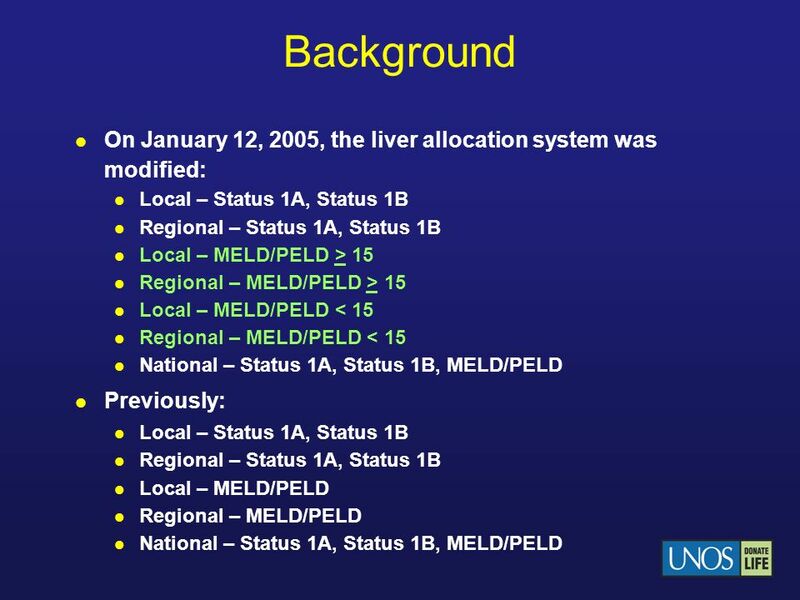 Not room for all possible diagnoses on this slide. 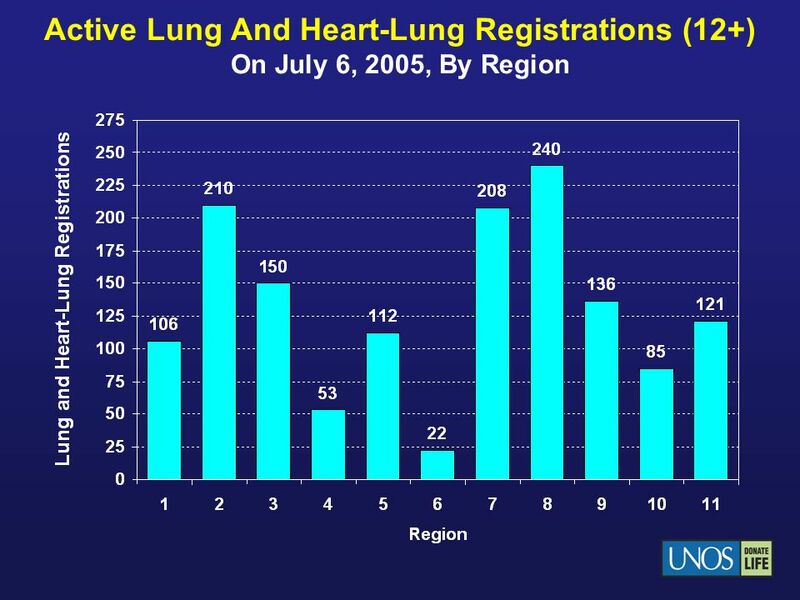 Number of active lung and heart-lung registrations varies widely by region. 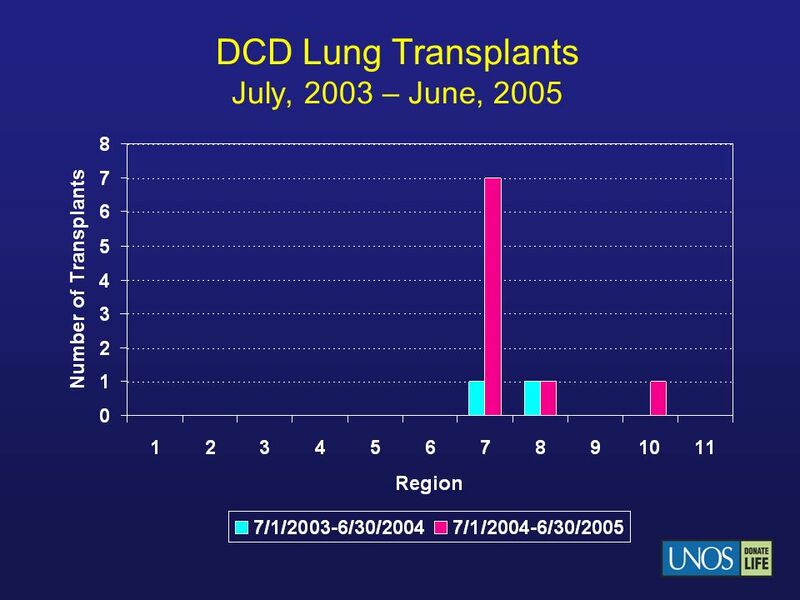 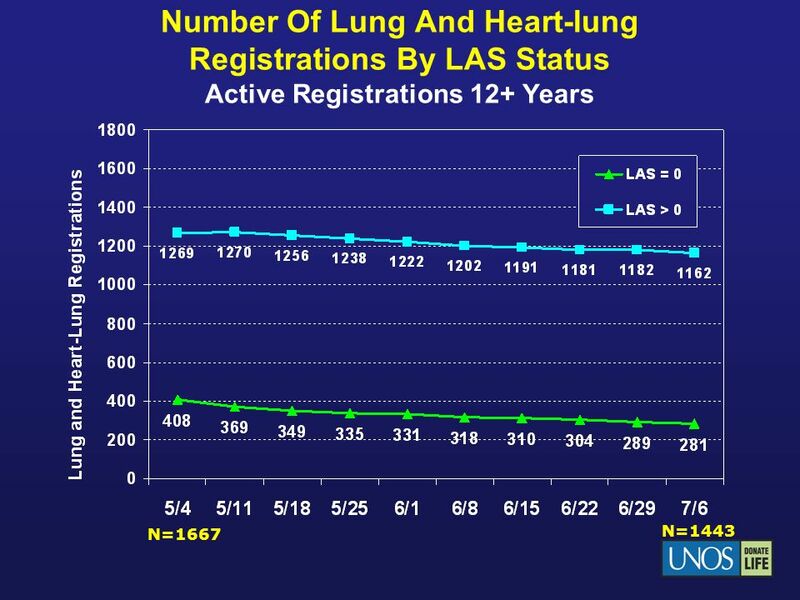 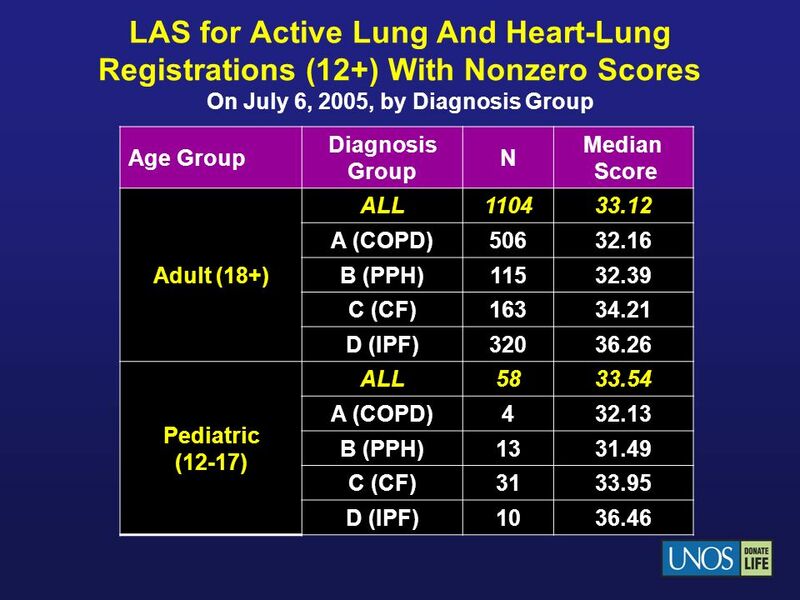 6 LAS for Active Lung And Heart-Lung Registrations (12+) With Nonzero Scores On July 6, 2005, by Diagnosis Group Age Group Diagnosis Group N Median Score Adult (18+) ALL 1104 33.12 A (COPD) 506 32.16 B (PPH) 115 32.39 C (CF) 163 34.21 D (IPF) 320 36.26 Pediatric (12-17) 58 33.54 4 32.13 13 31.49 31 33.95 10 36.46 Median score for lung and heart lung registrations on the waiting list on 7/6/05 by diagnosis group. 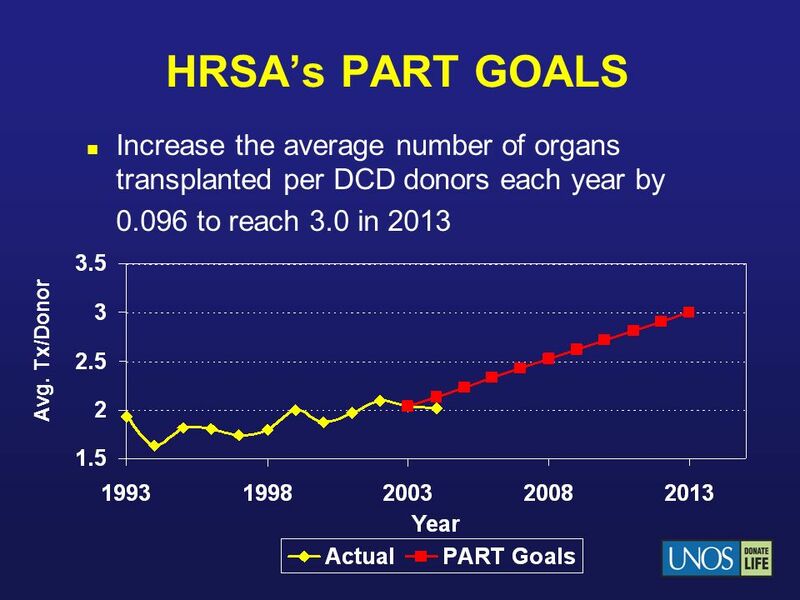 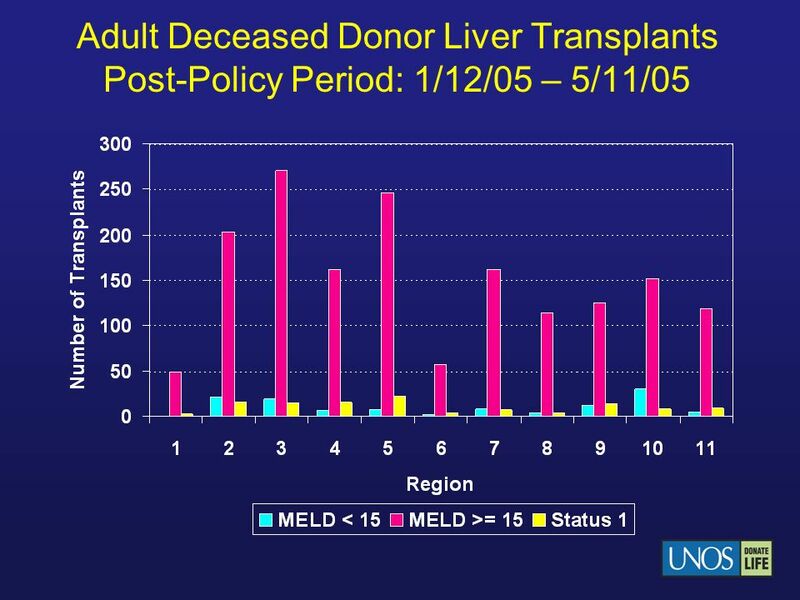 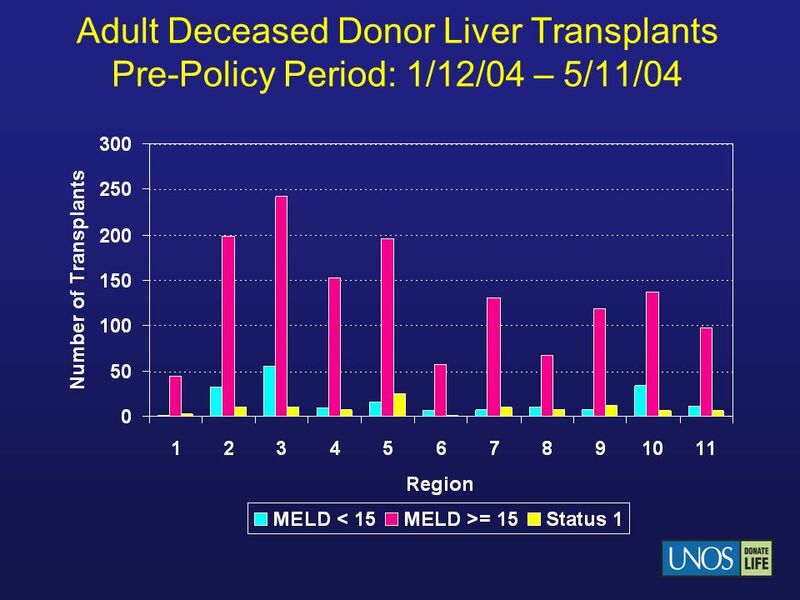 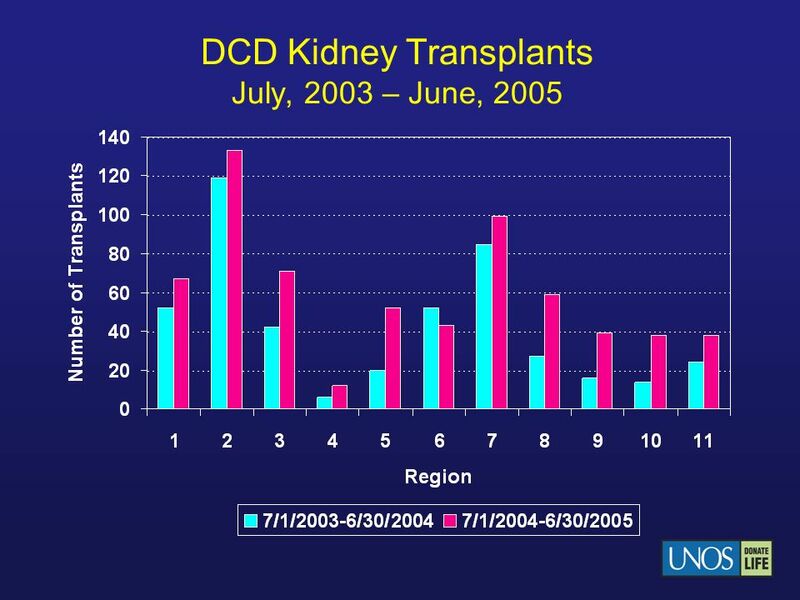 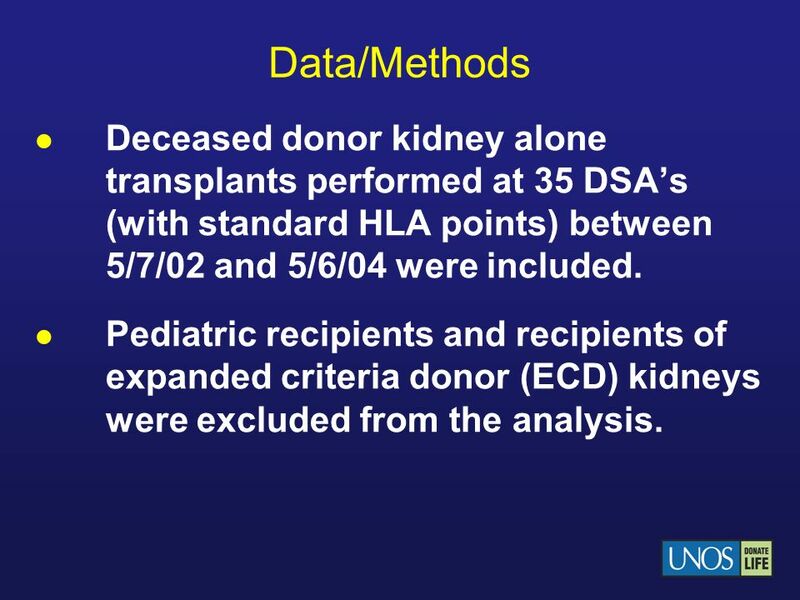 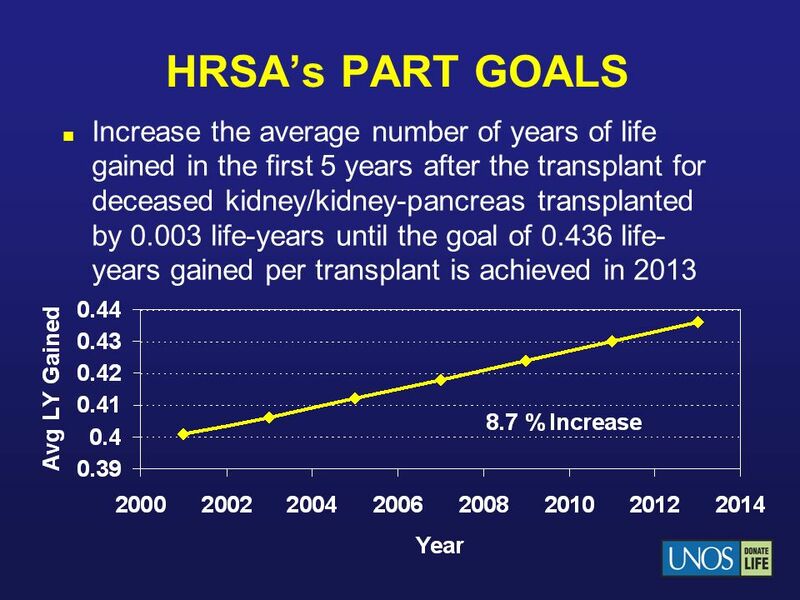 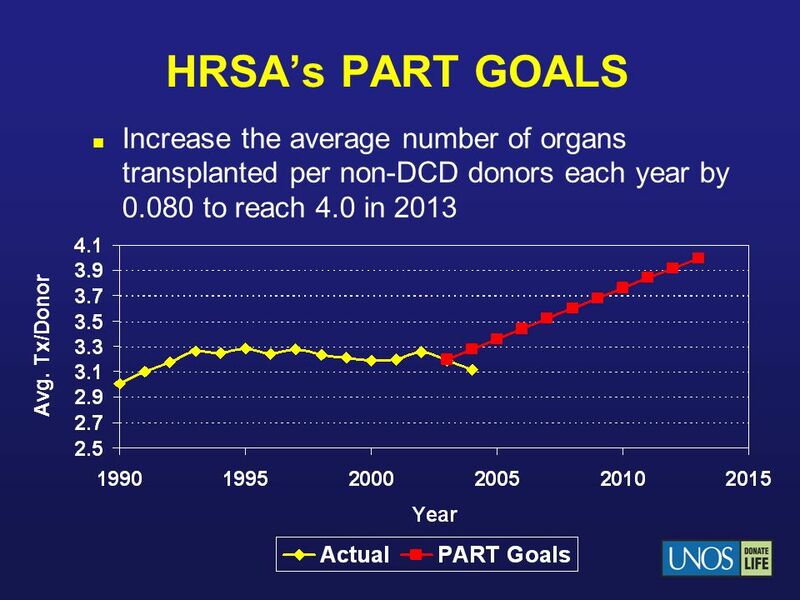 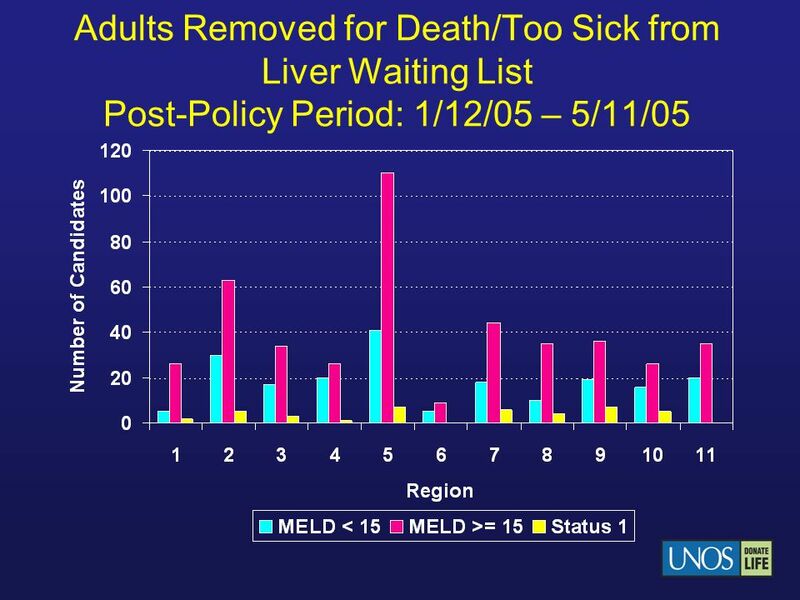 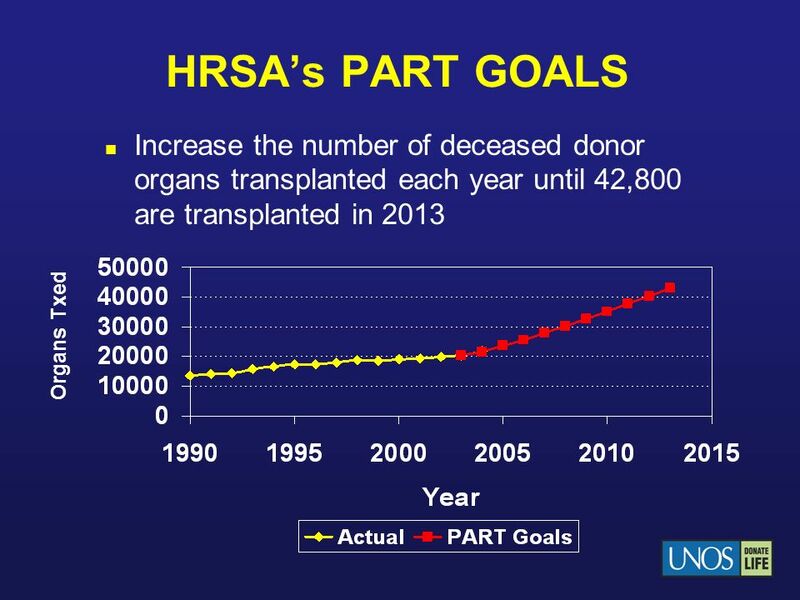 12 Data/Methods Deceased donor kidney alone transplants performed at 35 DSA’s (with standard HLA points) between 5/7/02 and 5/6/04 were included. 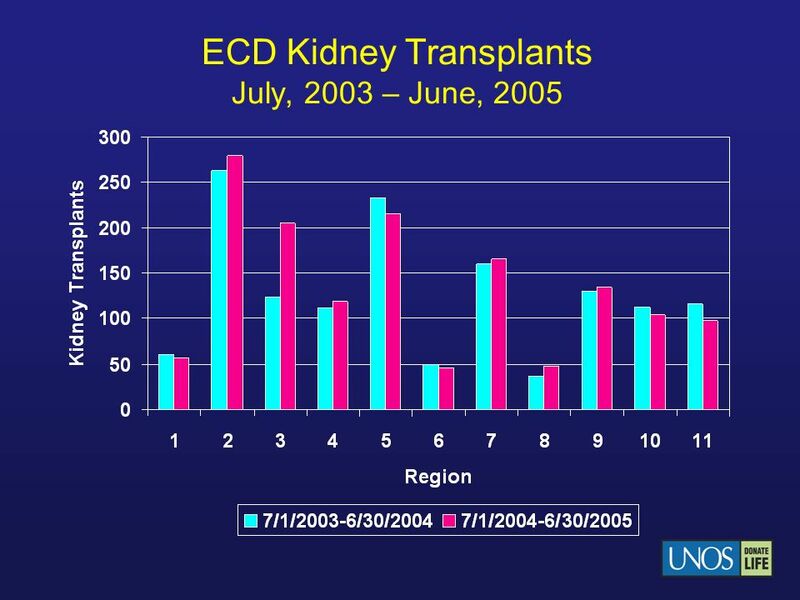 Pediatric recipients and recipients of expanded criteria donor (ECD) kidneys were excluded from the analysis. 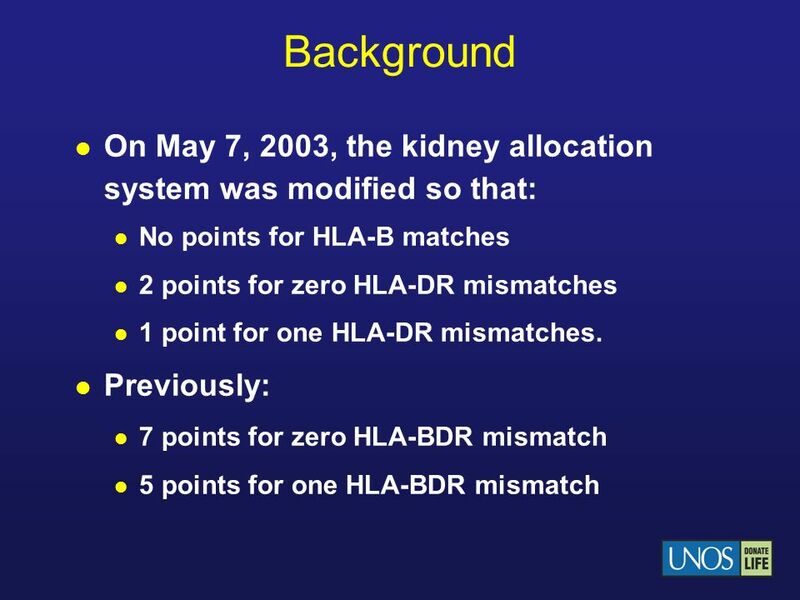 Out of the 58 DSA’s, only 35 use the standard HLA point system. 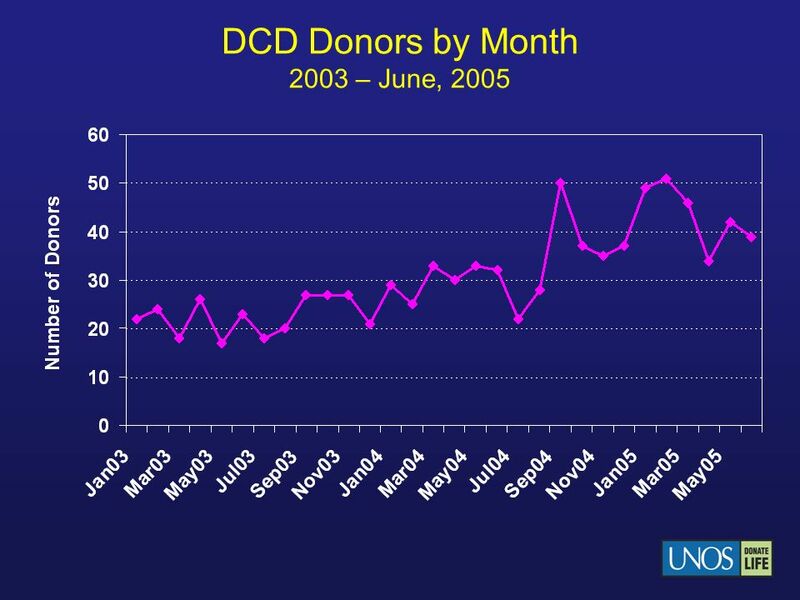 The remaining DSA’s modify the points in some fashion or another. 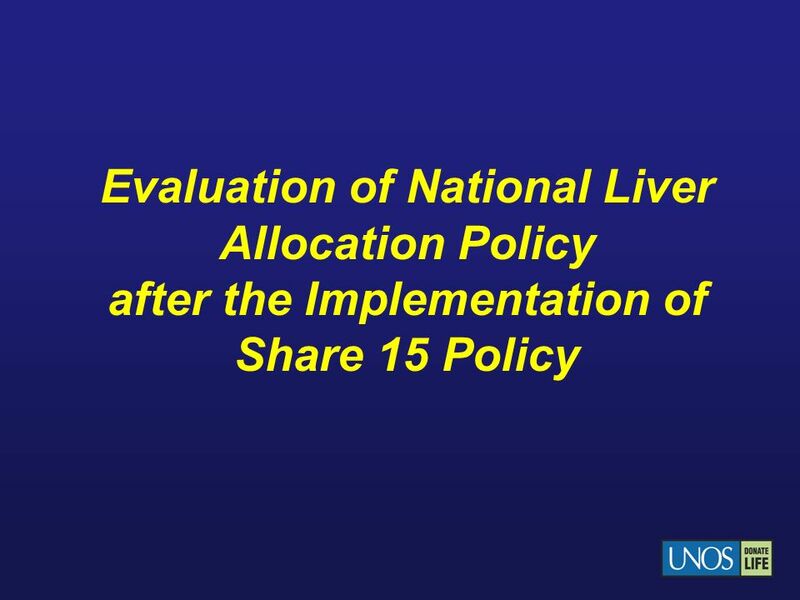 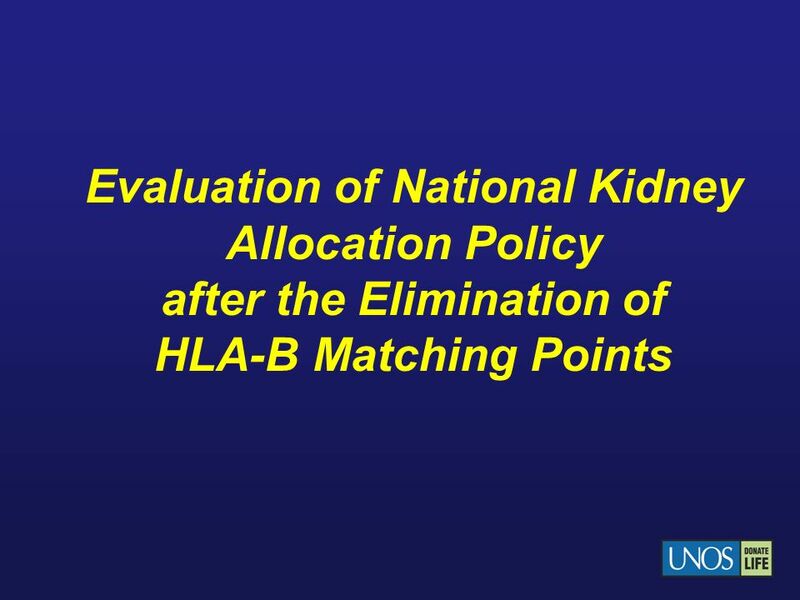 Of the 35 with standard HLA points, only 18 use the national system – the others have some sort of other variance or ALU. 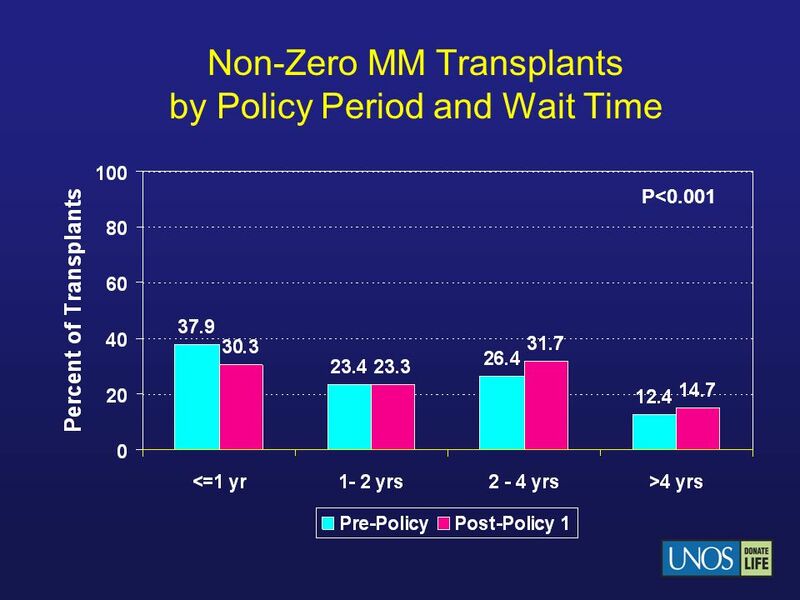 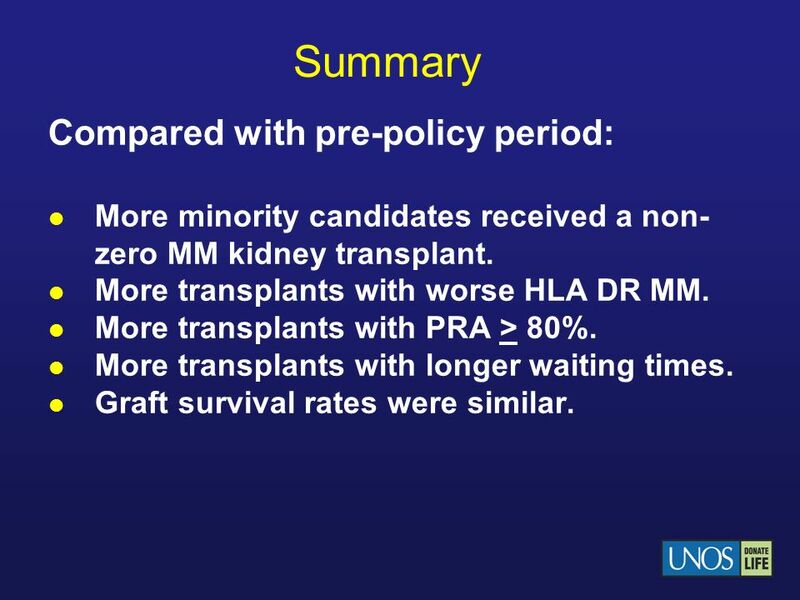 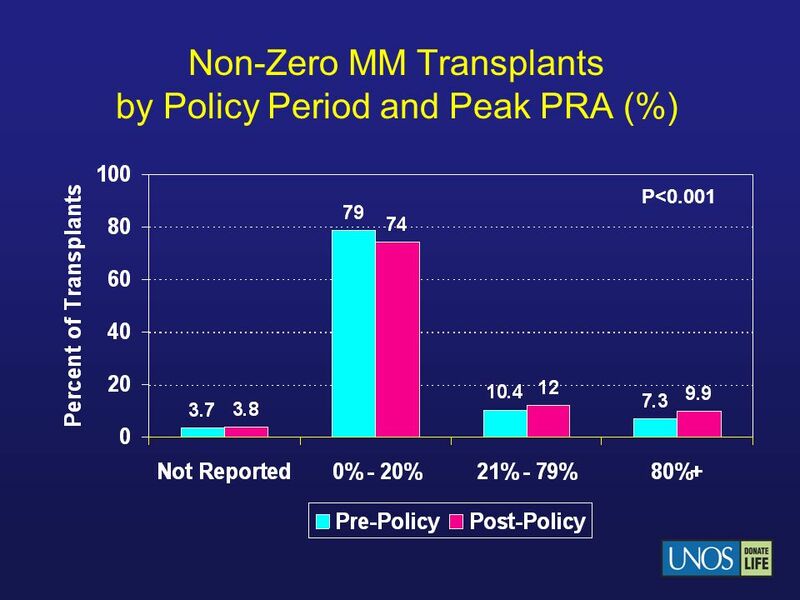 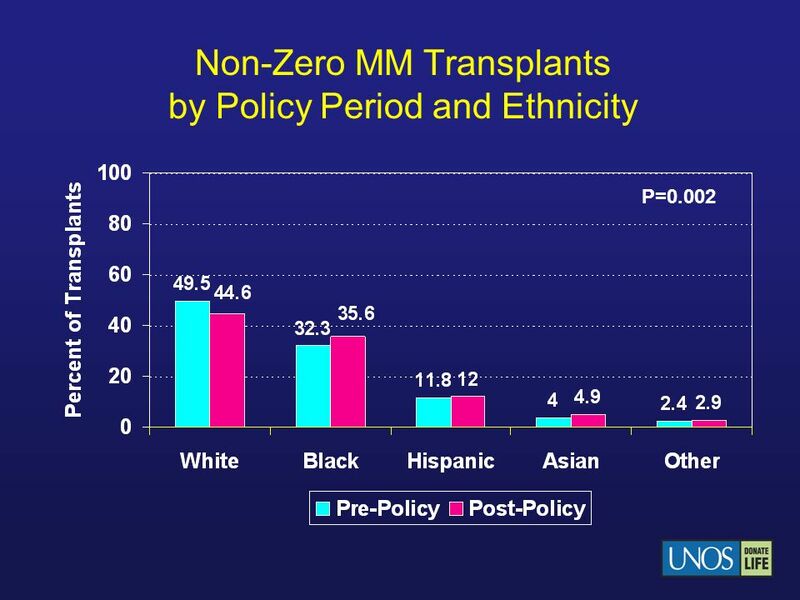 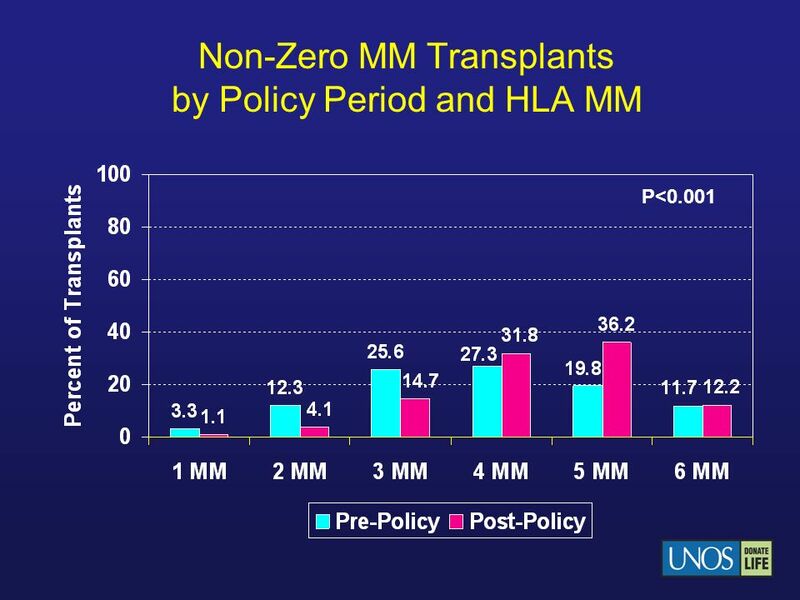 More minority candidates received a non-zero MM kidney transplant. 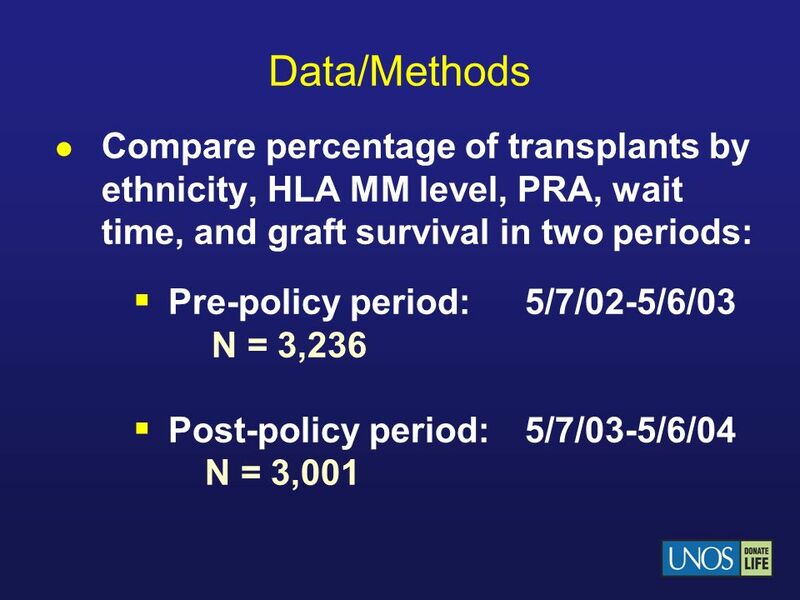 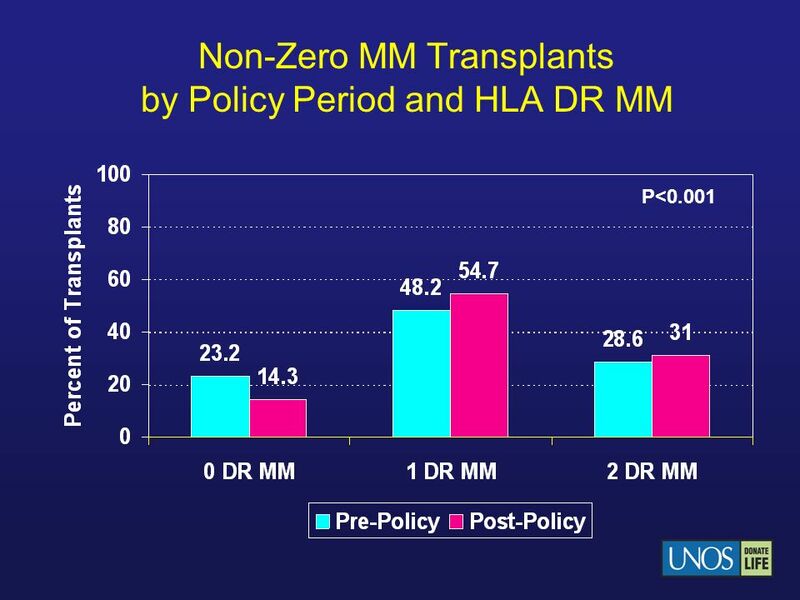 More transplants with worse HLA DR MM. 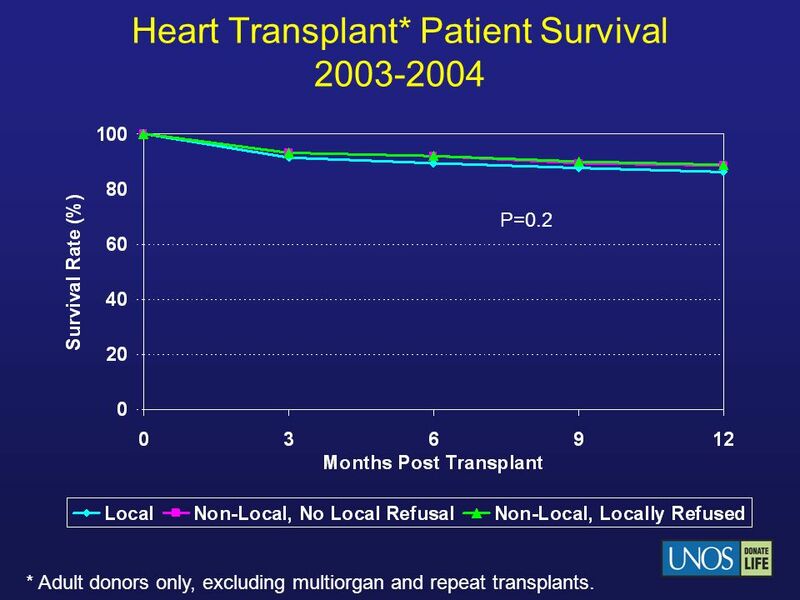 More transplants with PRA > 80%. 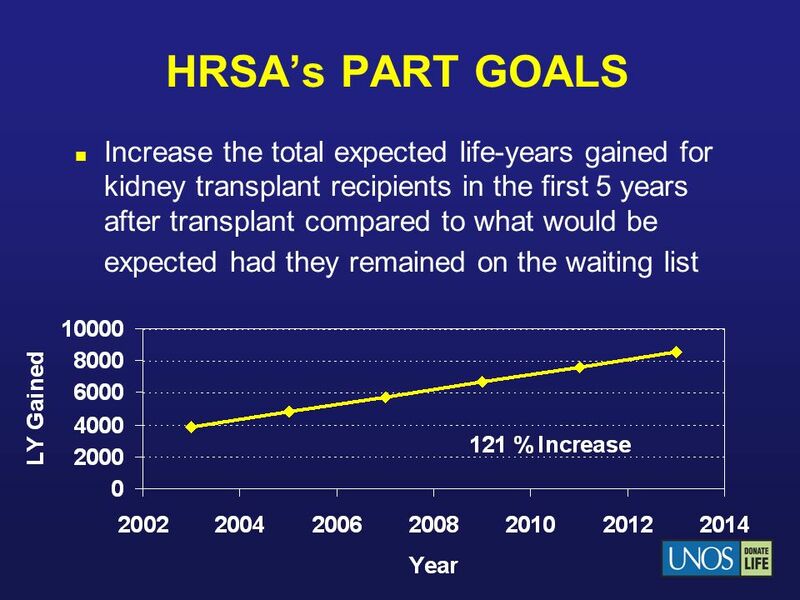 More transplants with longer waiting times. 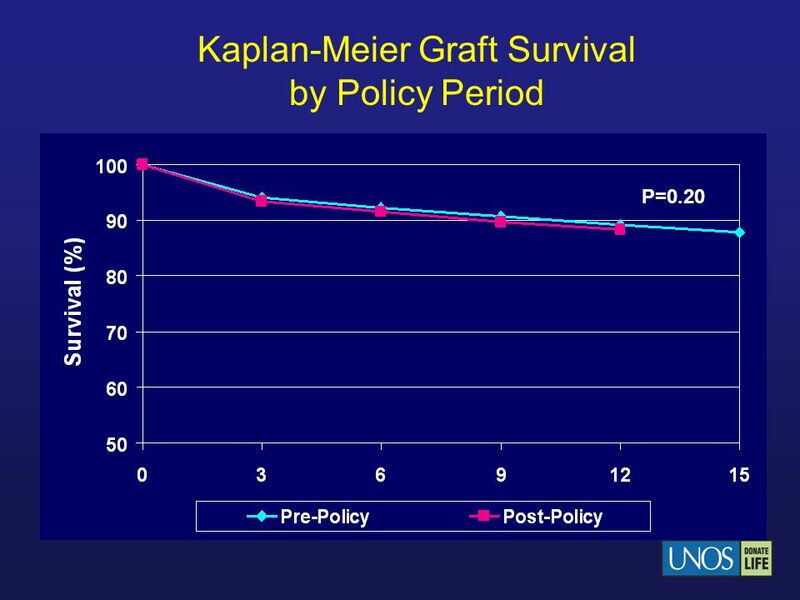 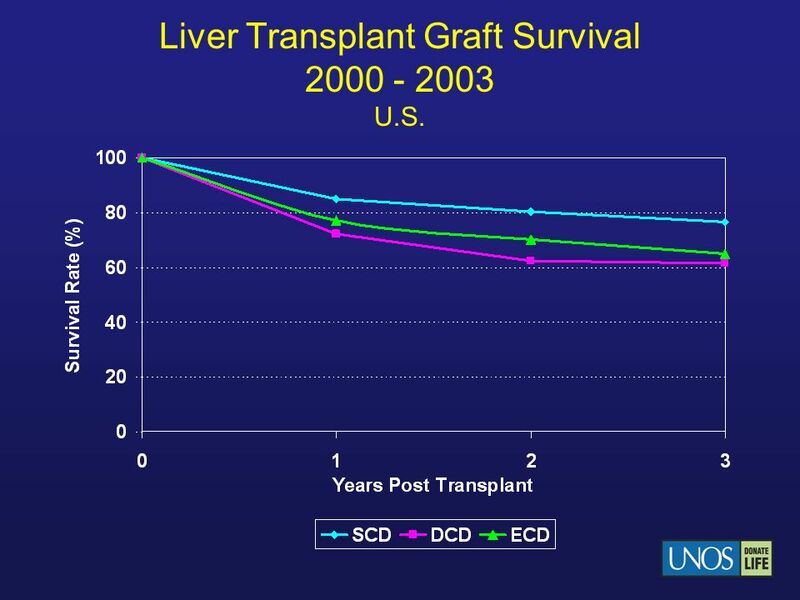 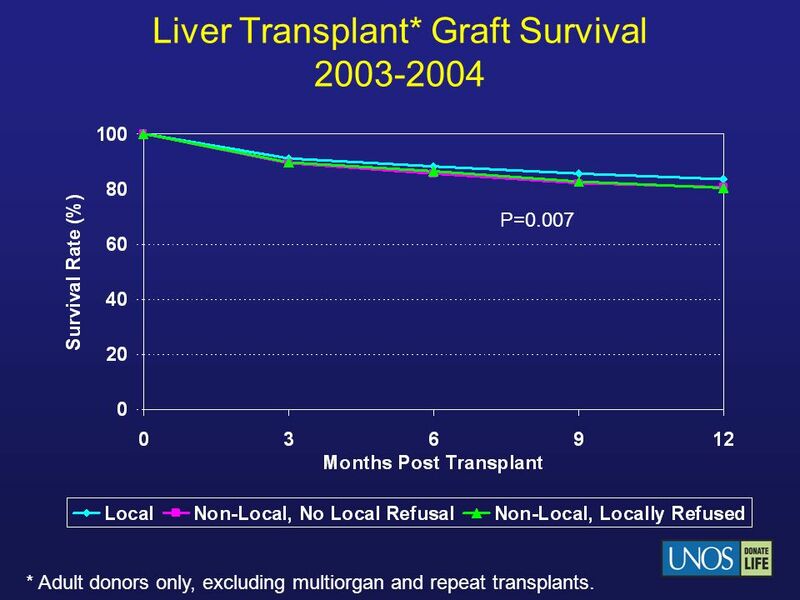 Graft survival rates were similar. 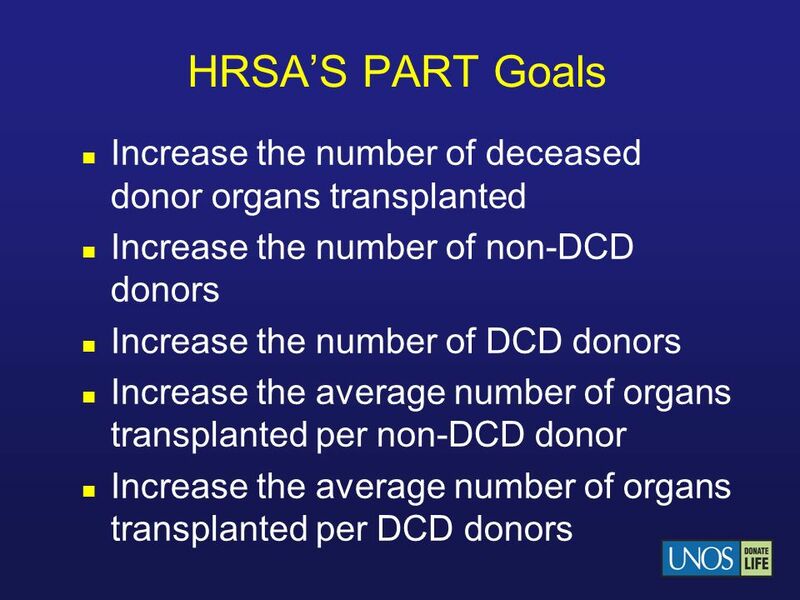 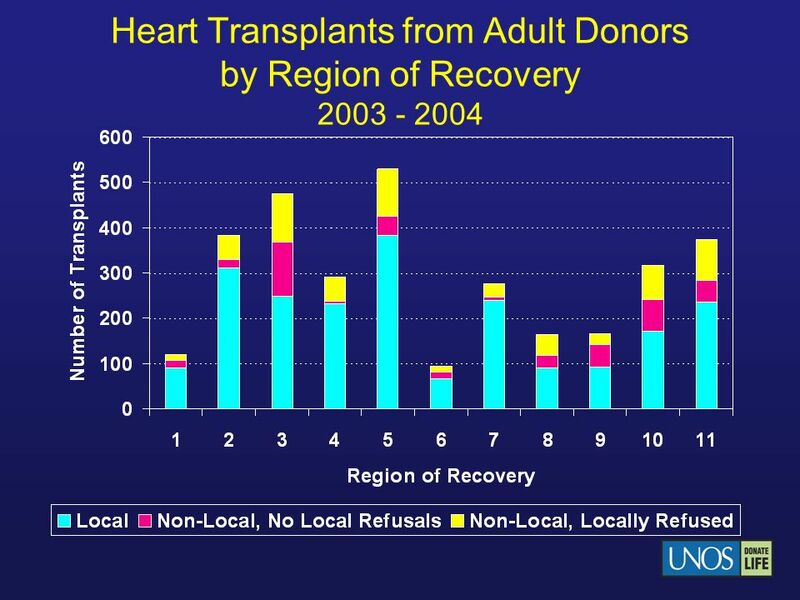 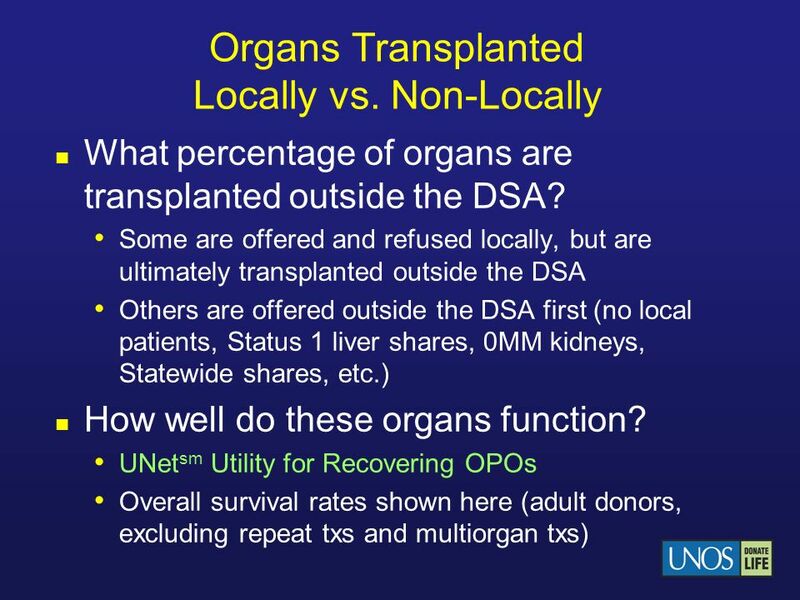 * Adult donors only, excluding multiorgan and repeat transplants. 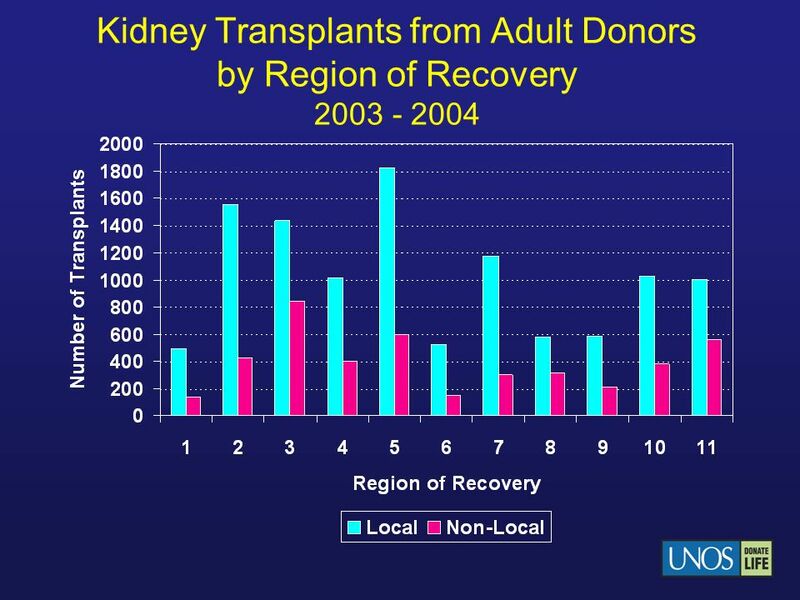 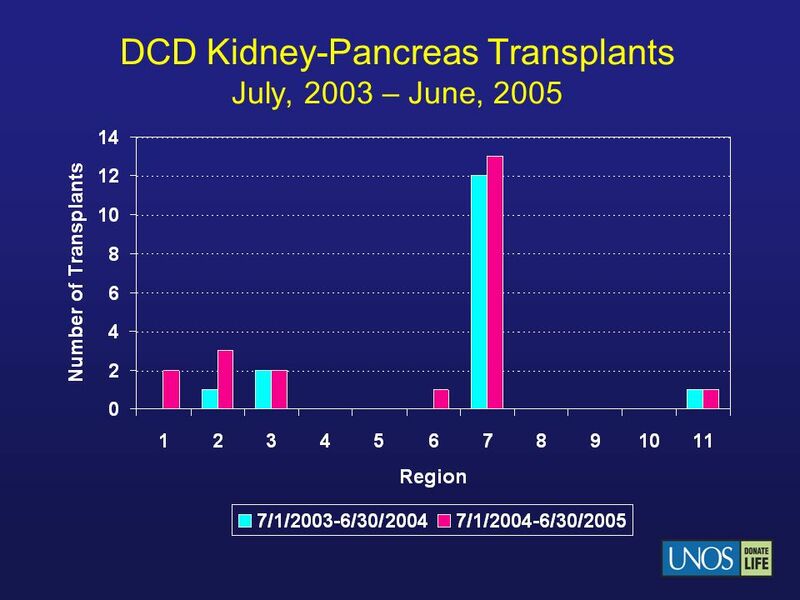 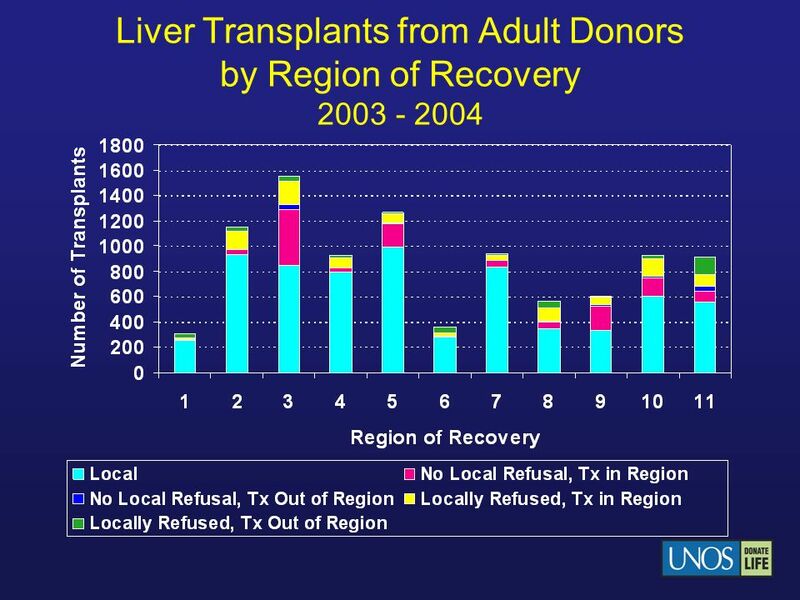 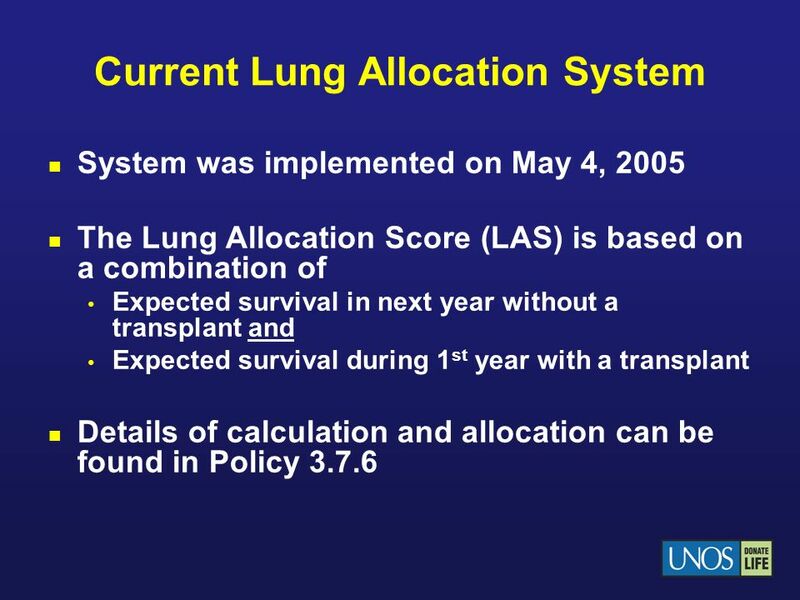 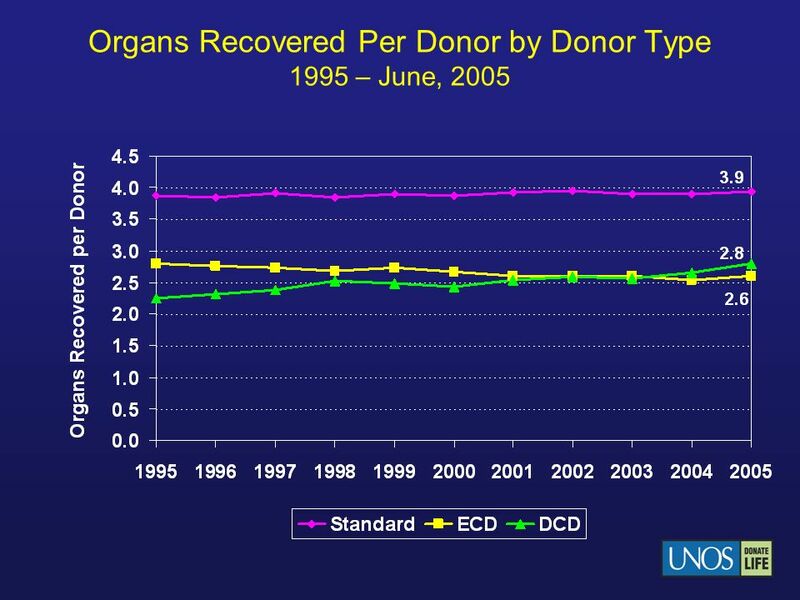 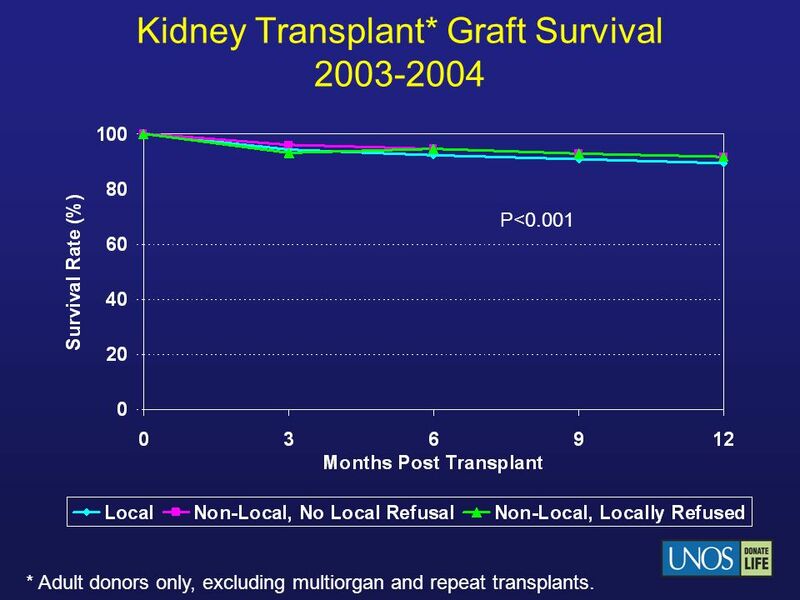 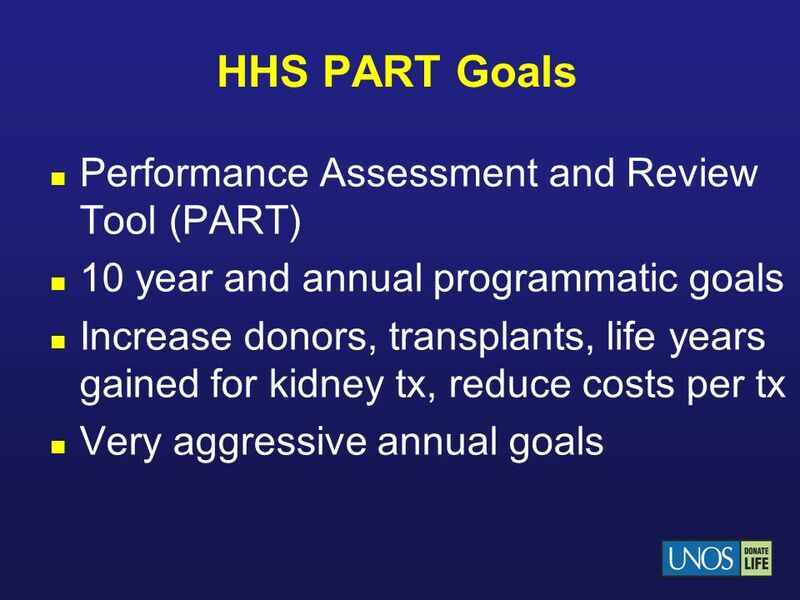 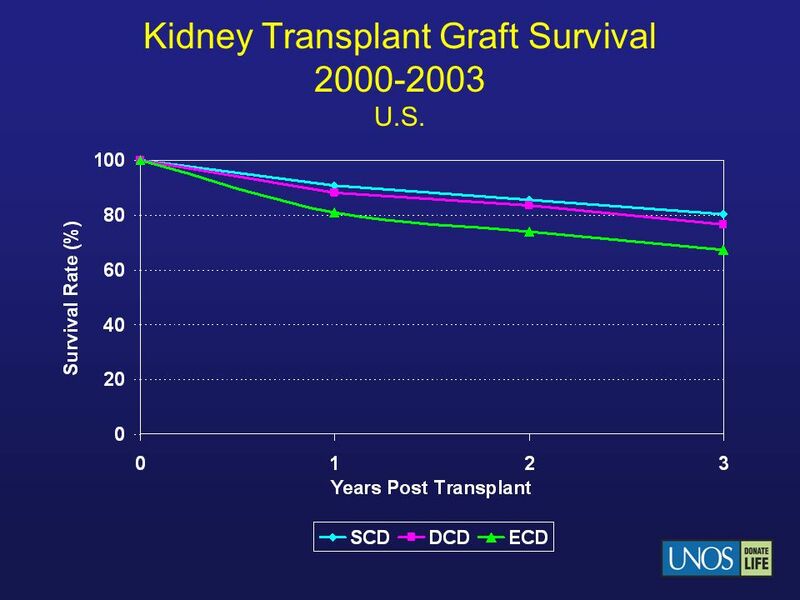 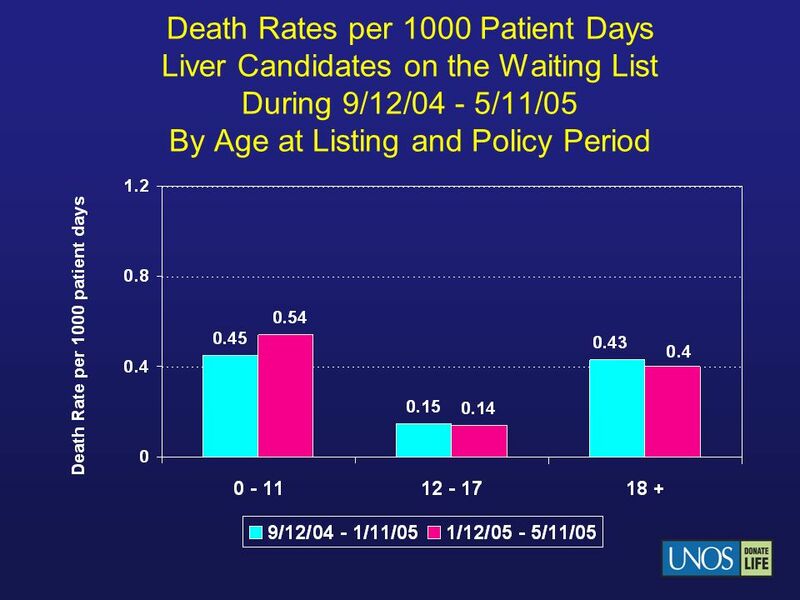 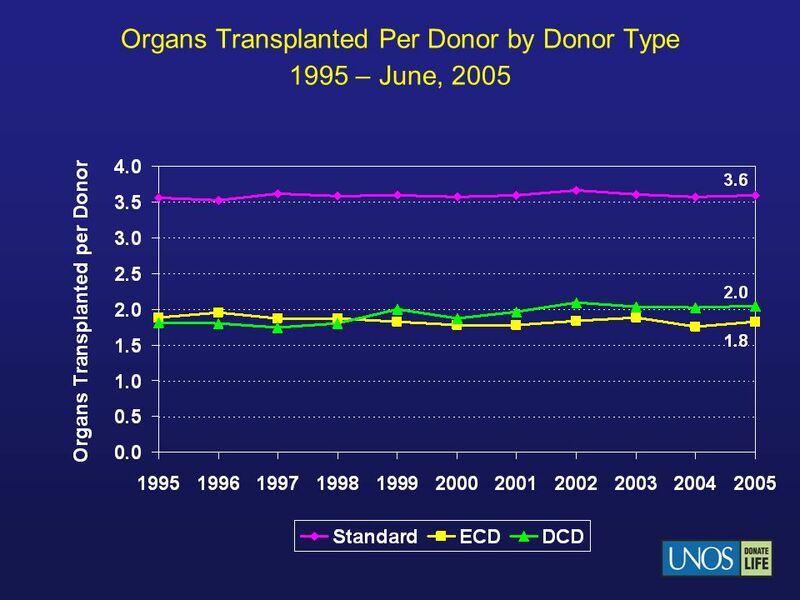 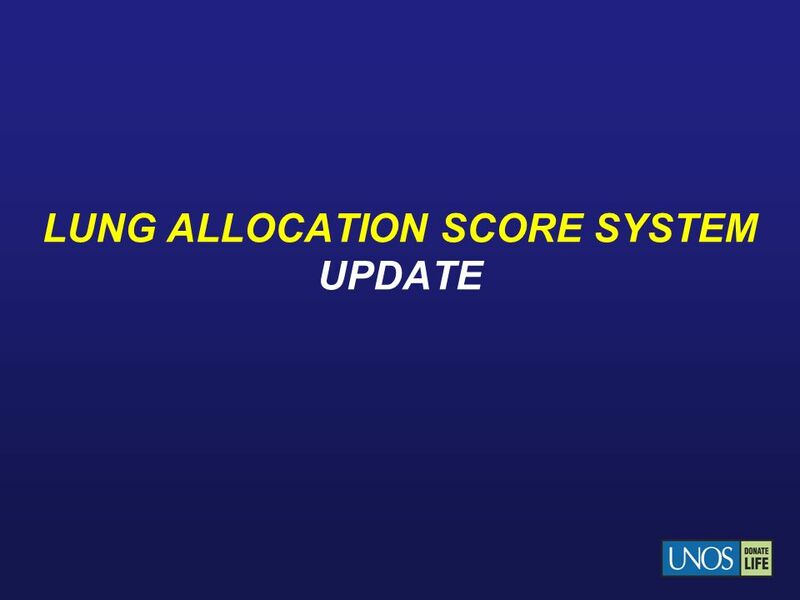 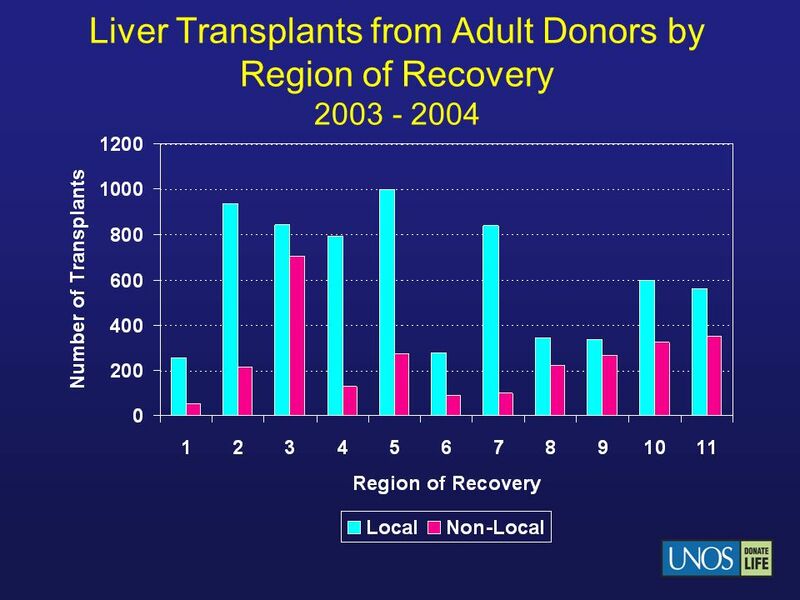 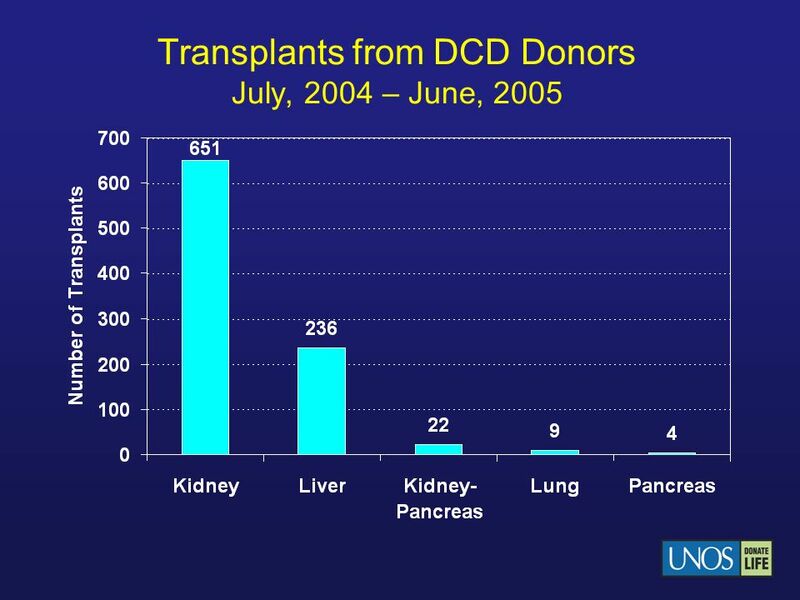 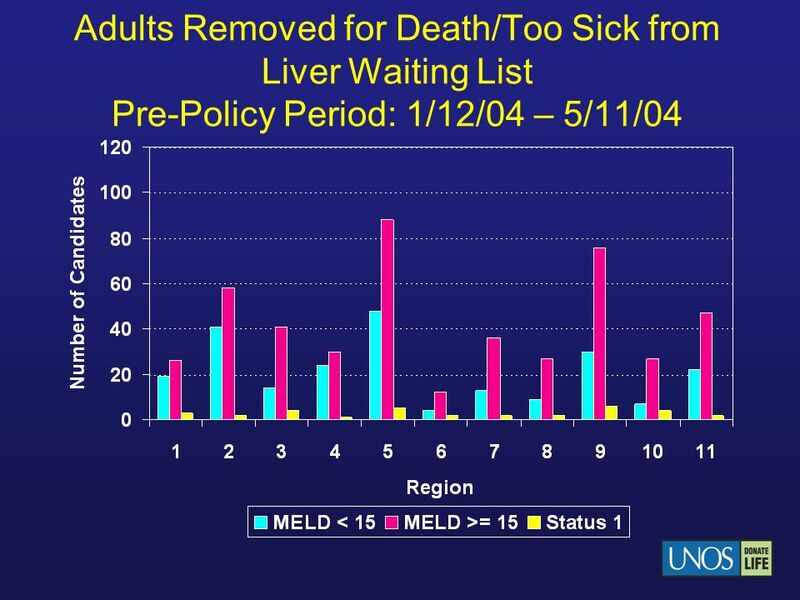 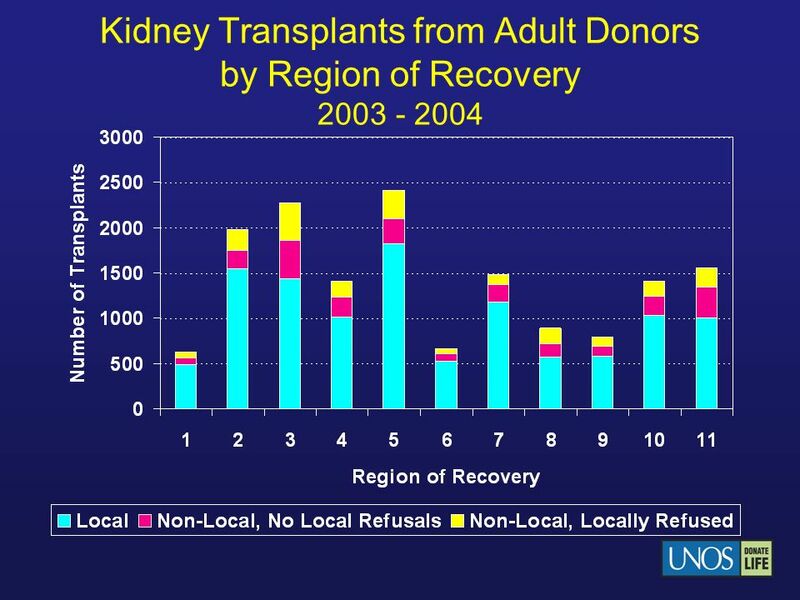 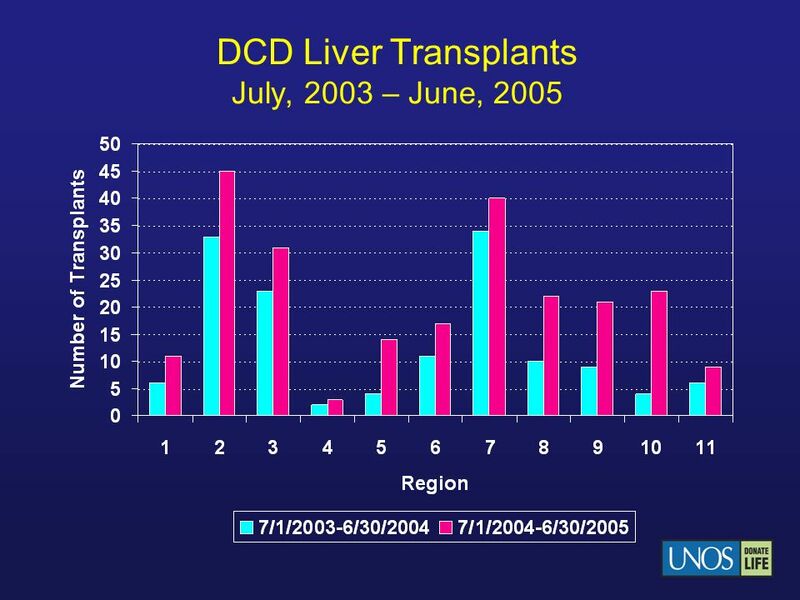 62 Kidney Transplant Graft Survival 2000-2003 U.S.
63 Liver Transplant Graft Survival 2000 - 2003 U.S.
Download ppt "LUNG ALLOCATION SCORE SYSTEM UPDATE"
Social deprivation, ethnicity and access to kidney transplantation in England and Wales Udaya Udayaraj. 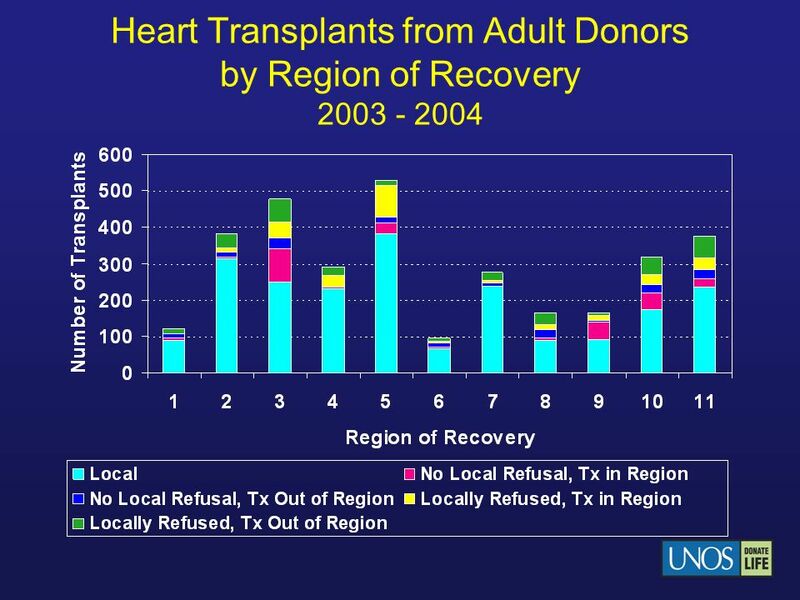 OPTN HEART ALLOCATION SYSTEM DATA UPDATE Based on OPTN data as of July 16, 2010 Fall 2010 Regional Meetings. 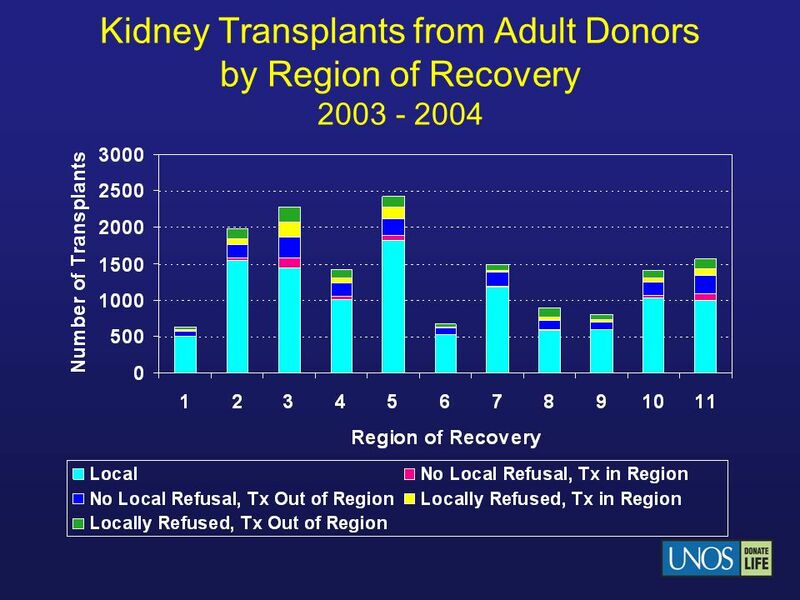 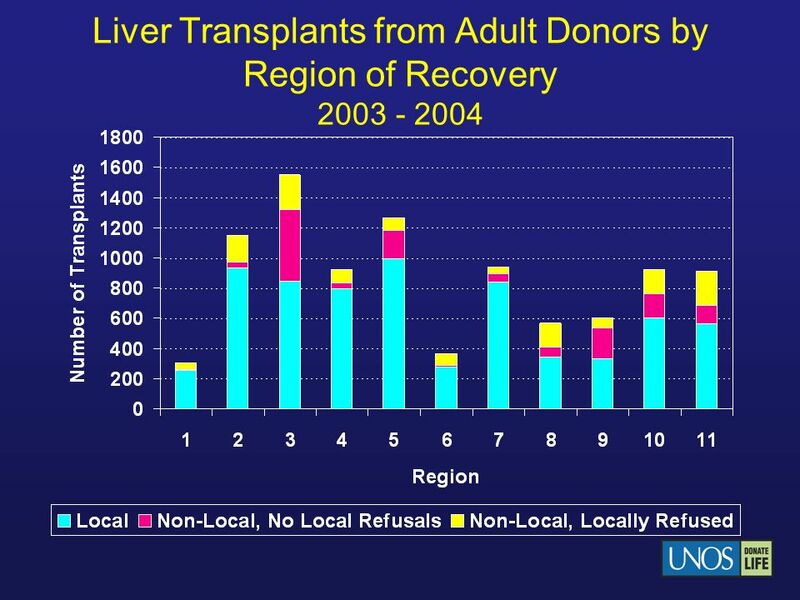 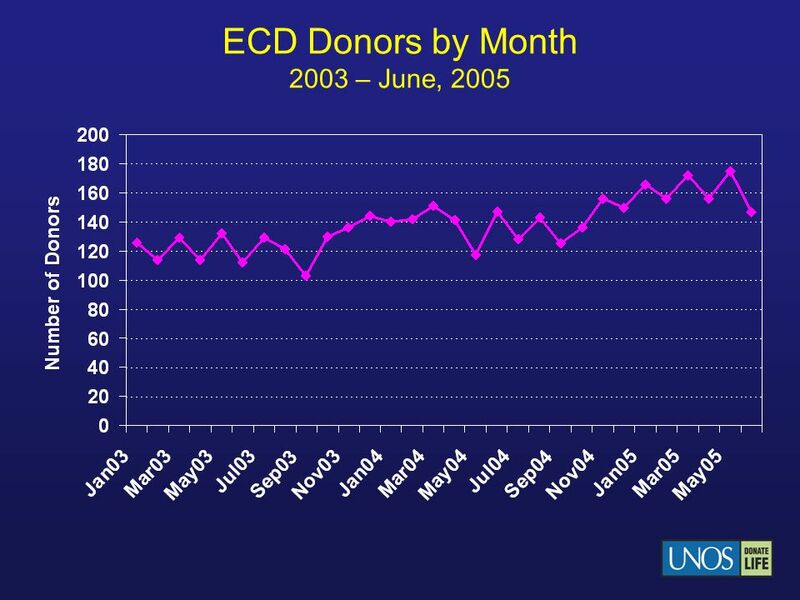 OPTN Regional Meetings Data Update Spring OPTN 2007 Donor, Transplant, and Waiting List Numbers. 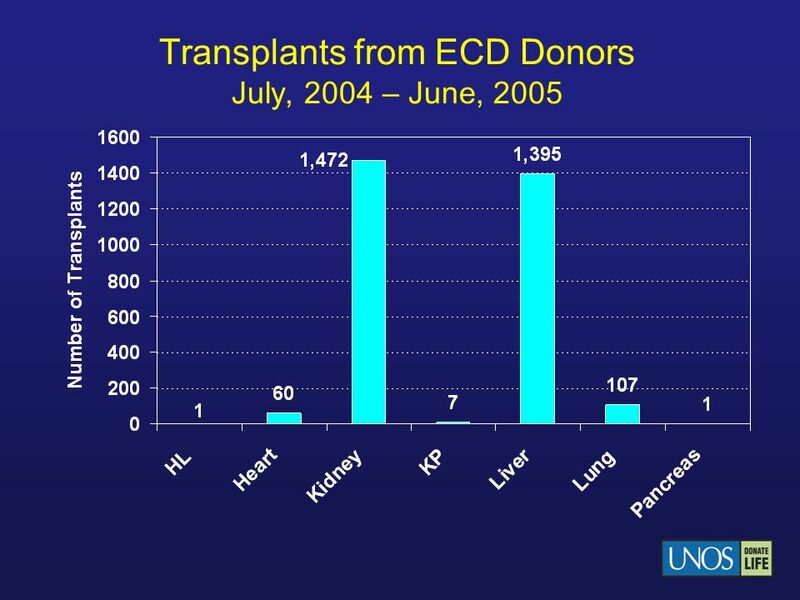 2004 ISHLT J Heart Lung Transplant 2004; 23: HEART TRANSPLANTATION Pediatric Recipients. 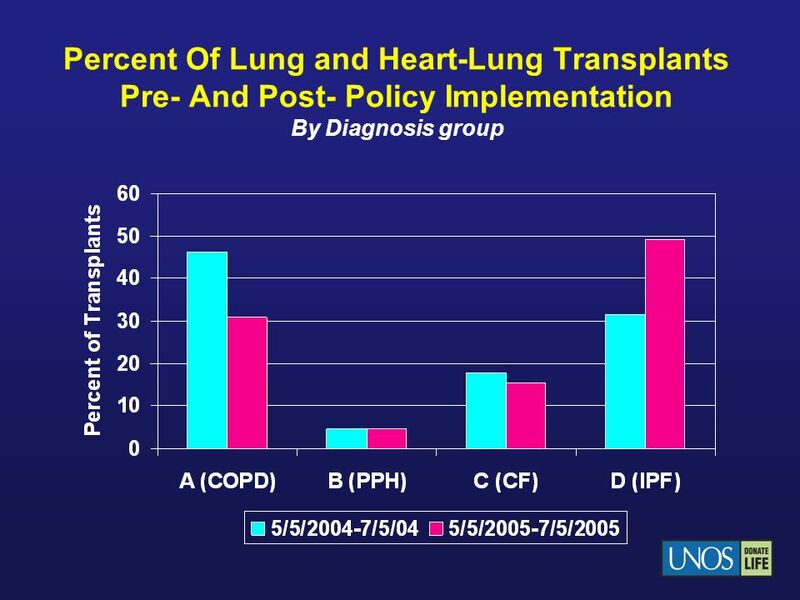 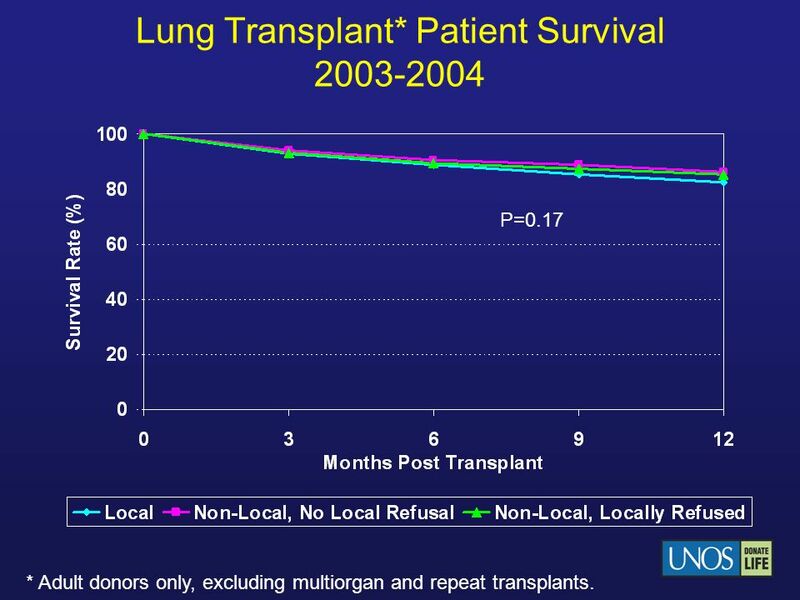 J Heart Lung Transplant 2009;28: LUNG TRANSPLANTATION Pediatric Recipients ISHLT 2009. 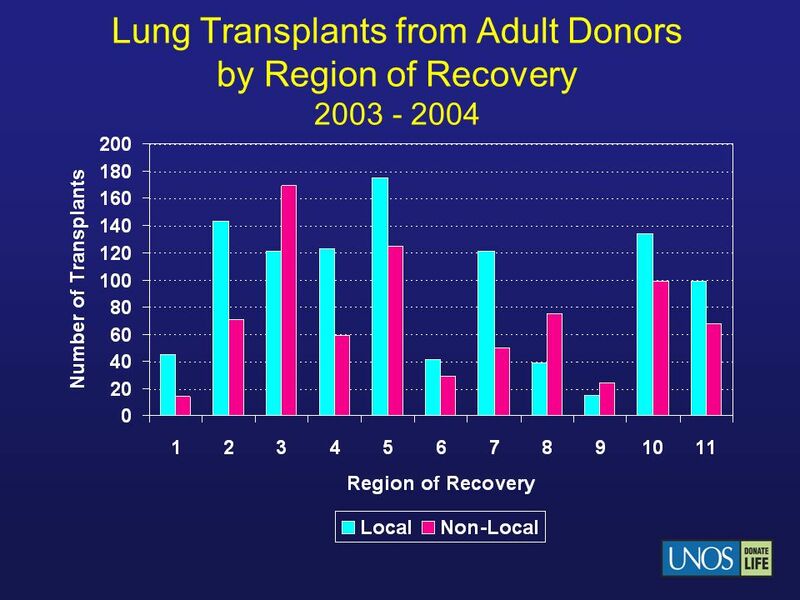 2002 ISHLT J Heart Lung Transplant 2002; 21: HEART-LUNG TRANSPLANTATION Overall. 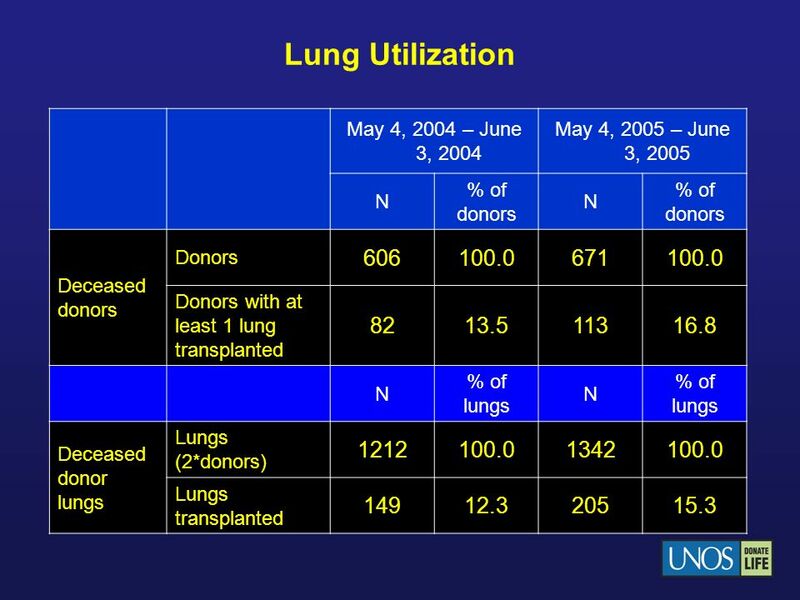 2004 ISHLT J Heart Lung Transplant 2004; 23: HEART-LUNG TRANSPLANTATION Overall. 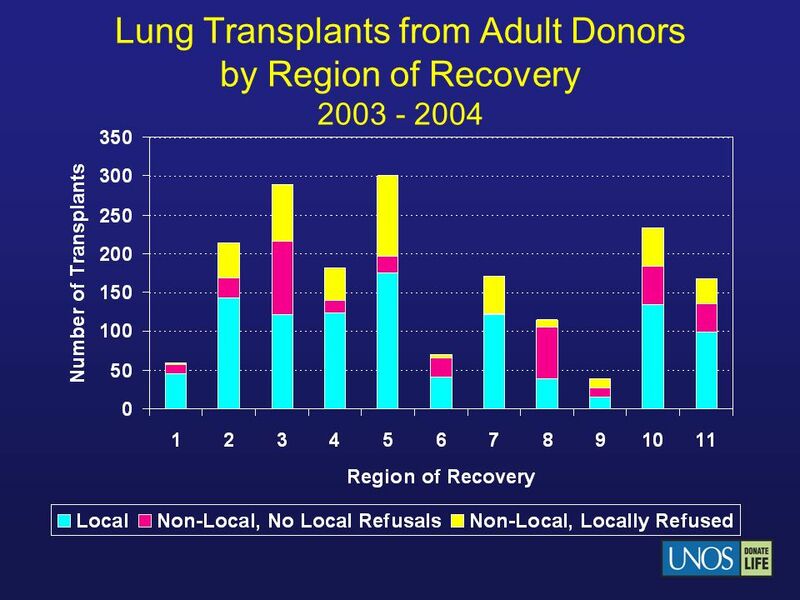 2004 ISHLT J Heart Lung Transplant 2004; 23: LUNG TRANSPLANTATION Pediatric Recipients. 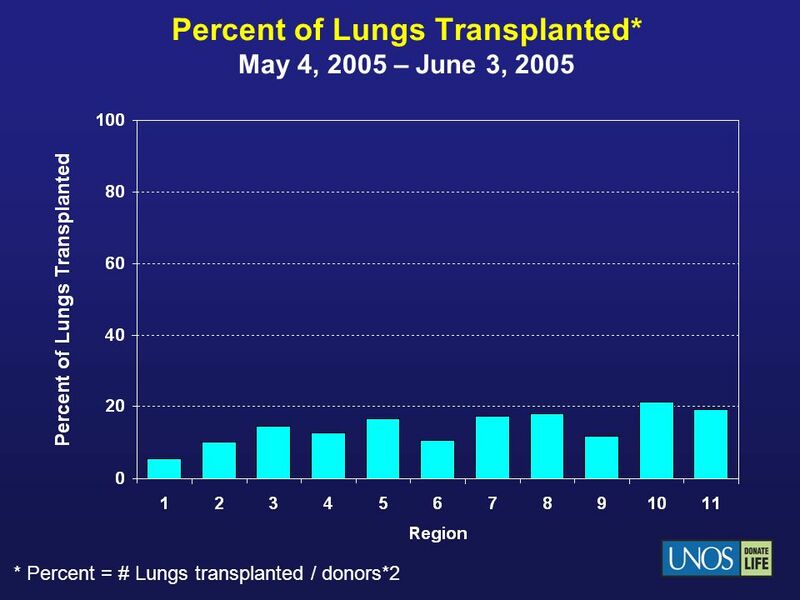 J Heart Lung Transplant 2009;28: HEART TRANSPLANTATION Pediatric Recipients ISHLT 2009. 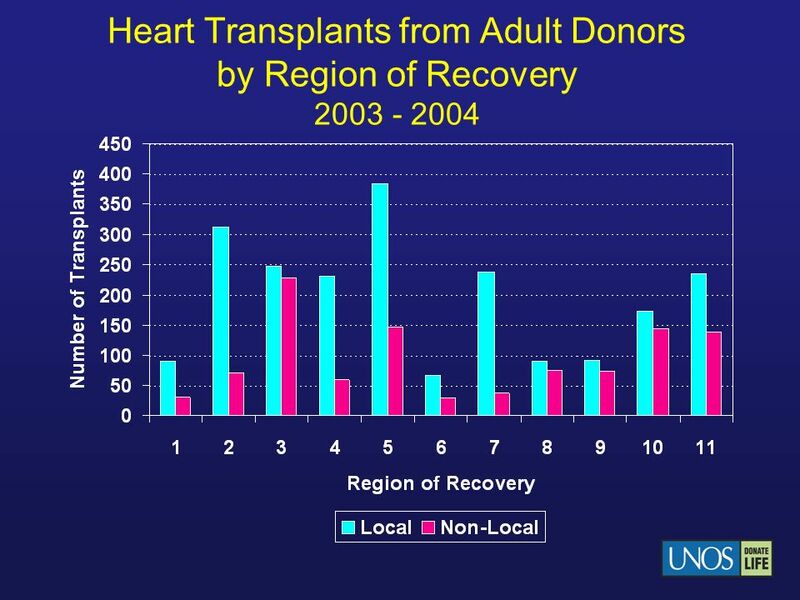 2003 ISHLT J Heart Lung Transplant 2003; 22: HEART TRANSPLANTATION Overall.